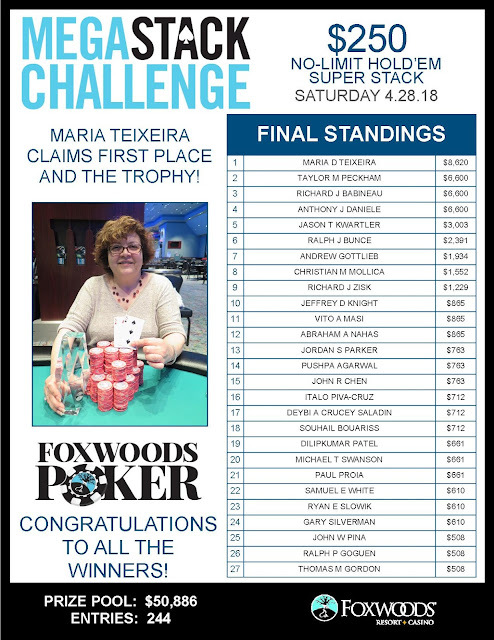 Martinho Camara raises in early position, and Stavros Parmaxidis moves all in for around 800,000 in middle position. Mike Tokatlyn moves all in from the big blind, and Camara folds. "I wont show those," Camara says as he mucks his cards and walks away from the table. 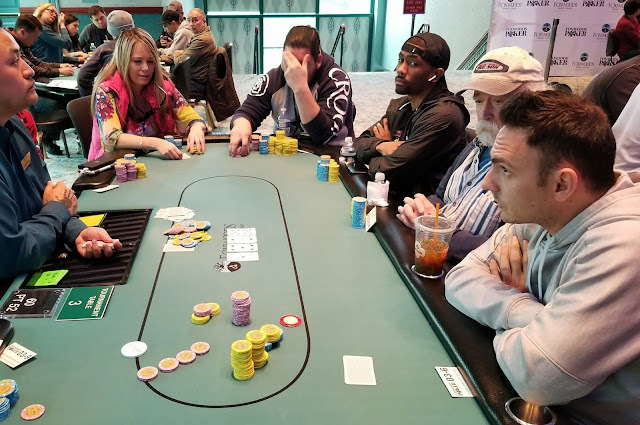 The flop comes K♠10♠4♣, gibing Parmaxidis the lead with a pair of aces, but the 7♣ on the turn gives Tokatlyn a set, and the 8♠ on the river becomes inconsequential. Facing a raise from Sean Moynihan in the cutoff, The General moves all in from the big blind. 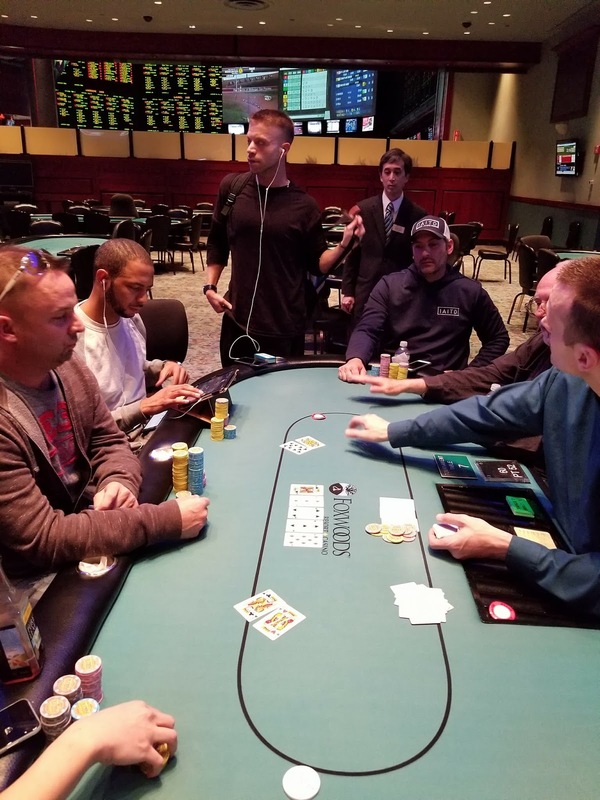 Moynihan snap-calls, and the players table their cards. The board runs out Q♥6♥2♦6♦J♣, and the General is eliminated in 11th place. 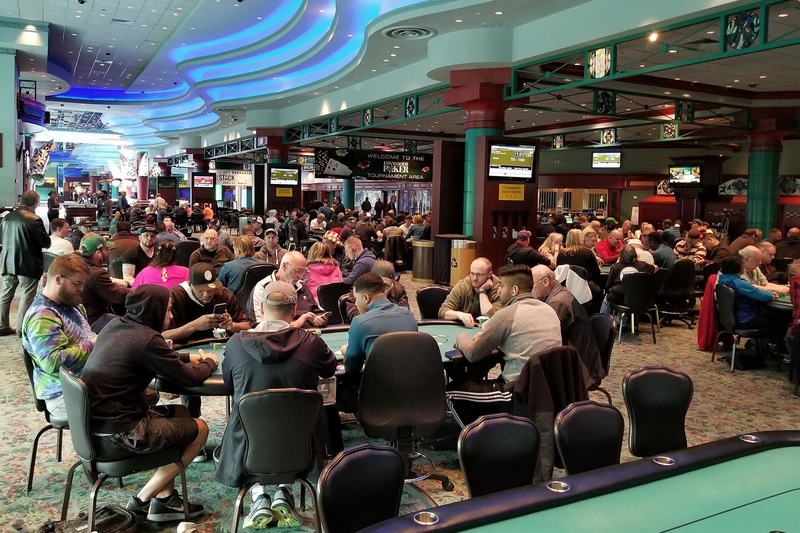 The final ten players are now taking their seats at the final table. A list of names and chip stacks will be posted shortly. According to a few players at the table, The General recently doubled through start of day chip leader Paul McCabe. The General raised to 57,000 from under the gun, and Paul McCabe called in middle position. The flop came A♥9♣8x. The General checked, and McCabe checked behind. The turn was the 4♥. The General bet 50,000, and McCabe quickly moved all in, having the General covered, and the General snap-called. The river was a 2, and the General doubled up while McCabe was left with less than ten big blinds. There is around 150,000 in the middle, and two players looking at the Q♦9♦5♥J♠ board. Billy Papadopoulos moves all in from the hijack for 121,000, and Paul McCabe goes into the tank on the button. McCabe stands up in his chair, and thinks for over two full minutes. The 3♣ river is safe for Papadopoulos, and he doubles through the start of Day 2 chip leader. There is around 110,000 in the middle, and two players looking at the Q♥10♠7♥Q♣J♣ board. 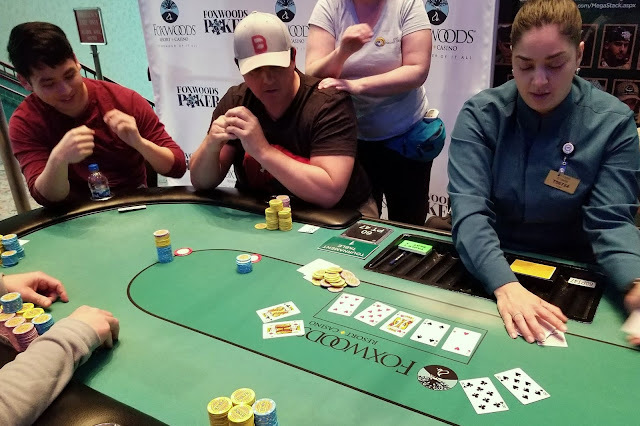 Foxwoods Poker Classic trophy winner Andrew Weinstock bets 71,000 in the big blind, and David Chang moves all, having Weinstock covered, in the hijack. "No way!" Weinstock exclaims, "You could have pocket jacks here I suppose," he says as he leans back in his chair and puts his hands on his head. He thinks for nearly three minutes before showing the Q♦ and then folds. "I have one of those too," Chang says as he turns over the Q♠. "Yeah, but what was the other one?" Weinstock asks. Chang turns over the 10♥ for a full house. "That was a great fold," Chang says to Weinstock. "I was so sad when you shoved. I thought I was betting for value, and then I realized when you shoved immediately, that you expected me to call, and I was likely behind." Weinstock says. "Did you say you had jacks there?" a player not involved in the hand asks Weinstock. "No, I said he could have jacks," Weinstock responds. A few other players comment on the great fold, as the next hand is being dealt. This hand pushes Chang into the chip lead, as he inches within reach of being the first player to cross over the million chip mark. There is around 100,000 in the middle, and two players looking at the 10♦5♠2♠A♥ board. Laurie Hilton checks in the big blind, and Stavros Parmaxidis moves all in from middle position. Hilton asks for a count and upon hearing the 124,000 total, goes deep into the tank. She stares at Parmaxidis for a few minutes before saying, "I dont have much, but I think I have the best hand...I think you might be on a flush draw." She confirms the 124,000 total with the dealer, and then moves the chips forward to call. Parmaxidis turns over A♠6♠ for a pair of aces and the ace-high flush draw. "Oh you have me crushed, I need another ten," Hilton says as she turns over 10♣6♥. The 5♦ river is safe for Parmaxidis and he doubles up. A player in early position moves all in for 600 total. It folds to the button who looks questioningly at the table across the table, and the dealer confirms that the player in all in for less. The button calls, as does the small blind. Ryan Clements raises to 20,000 in the big blind, and the button and small blind both fold their hands. "Why raise there? Why not just call and give three players a chance to get him out," the button asks Clements. Clements says, "Because I had these," as he turns over K♥K♣. "Kings are good," the player in early position says as he turns over Q♦10♣. The board runs out, 8♦4♠3♠3♦K♠ improving Clements to a full house, and eliminating his opponent from play. The remaining 40 players are now bagging up their chips for the night, and will return to play Day 2 tomorrow at 11am. According to Giuseppe Ruvolo, he recently eliminated Foxwoods regular John Caputo to cross over the 200k chip mark. There were two limpers pre-flop, and John Caputo made it 7,000 in the small blind. Ruvolo called in the big blind, and both of the other players folded. The flop came A-Q-6. Caputo bet 12,000, and Ruvolo called. The turn was a 10, and Caputo moved all in. Ruvolo quickly called with his set of sixes, and Caputo turned over 7-7 for a pair of sevens. The river card was safe for Ruvolo, and Caputo was eliminated from play, while Ruvolo now sits with around 260,000.